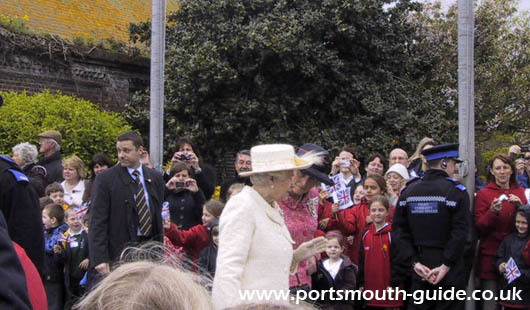 On the 30th April 2009 Portsmouth welcomed the Queen and Duke of Edinburgh to mark 65years since D-Day. The Queen and Duke were welcomed by school children at the D-Day Museum before they entered the museum. Inside the museum the Queen and Duke toured the Overlord Embroidery before making their way to Guildhall Square where crowds waited to greet the couple. The refurbished bells within the Guildhall were rung for the first time since their refurbishment. Inside the Guildhall the Queen and Duke met veterans from World War II before sitting down to lunch. For more details about the D-Day 65 events that look place in Portsmouth please click here.